Sold by Amazing Finds Canada and Fulfilled by Amazon. Gift-wrap available. Sold by Amaz-zen Products Co.
Sold by Amazing Finds Canada and ships from Amazon Fulfillment. Sold by Batts Locker and ships from Amazon Fulfillment. Mad Men took a daring turn at the end of the third season by rebooting itself (the principals at Sterling Cooper left to form their own upstart agency in the face of a corporate takeover), and it pays off big time in season four. Set a year after that season finale, the brand-new agency Sterling Cooper Draper Pryce is struggling to make a name for itself and sign on new clients; Roger (John Slattery) finds himself at the beck and call of the firm's largest account, Lucky Strike; Pete (Vincent Kartheiser) faces impending fatherhood; Peggy (Elisabeth Moss) asserts herself in a position of power among her sexist fellow copywriters; Joan (Christina Hendricks) sees her husband off to Vietnam and finds herself in a compromising predicament. Then there's Don (Jon Hamm, doing his finest acting yet), who brazenly gambles the firm's success on his impulses, lives alone except for a string of one-night stands, and exchanges curt phone calls with his ex-wife, Betty (January Jones), over parenting the kids. Don's rock bottom midway through the season (which hits somewhere around his career high) collides with the shattering loss of a loved one, and his attempts to improve himself include forging a new romance with a confident, intelligent marketing researcher (Cara Buono). But the woman with whom he's most deeply linked--platonically--is Peggy, and the two of them have a terrific episode all to themselves entitled "The Suitcase." 2.0 out of 5 starsWhere my Ad Buy Stopped. The season where the show started sliding and I stopped watching. What was one of my favourite shows in its first couple seasons simply grew stale and I gave up. The characters are living in the 60s, but they don't seem to understand or truly be affected by the change going on around them as they stumble from one boozy lunch to the next awkward sexual encounter to the next boozy lunch. The costumes are still great, the sets are still great. The cast does what it can with the material its given--but that material is very thin on character development and character insight. I bailed partway through season 3 but came back and finished that one, convinced myself it was good, then started this one. Nope. I don't get the hype around this show's fourth season. This emperor has no clothes. This is a great drama which captures the evil of what Trump probably thinks of as making America "great again". Men behave like "real men" and it sends a primal cringe through you. It is like watching a car accident scene; morbid fascination prevents you from looking away. Performances are superb. Writing is well researched and the spectacle created by costume and sets are 98% precise. It is eye candy, brain candy, and one of the best series produced. I think it closely illustrates the psyche of the era. Start by watching the first couple of seasons. They are wonderful. Of course the acting is good and its fun set back when women really were second class and smoking wasn't bad for you! It's set in an advertising company with pile of different characters. Clever show in which you find the story line always brings in various issues of the time. It's now getting a bit boring. I bought the 4th season so you know that I'm hooked. After all, I've seen 1,2,3 and desperately needed 4. I love it. Characters are real. All have shared experience, some searing, some stupid, some sweet but it isn't a soap opera -- no side glances or knowing looks. It's like life is lived -- but it's Madison Avenue 1960s-70s! Mad Men is an awesome series and because it is set in the late fifties, early sixties it brings back a lot of memories of simpler times. There are very similar ads for the real products that they mention, that I can remember from my childhood. Another great season in this Series, I own them all on DVD and will watch them many times. I am only disappointed that the 5th season has been post-phoned for a year! Great show, AMC, you rock for shows!! 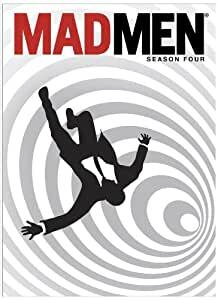 Wanting to check out the buzz around this program for myself so I purchased seasons 1-4 of MAD MEN. Suffice to say that MAD MEN will go down in TV history as one of the best, most entertaining, well produced & acted shows every. Right up there with I LOVE LUCY & SEINFELD. Just try to only watch 1 esipsode at a time. AMAZING. Treaty yourself and get the blu-ray version. Arrivé à temps. Fidèle à la qualité d'ensemble de la série.